Where was this book when I was growing up? Surely an elementary teacher mentioned the existence of colonies beyond the famous 13 in history class, but they apparently didn’t make much of a dent in the syllabus. Like most Americans, my founding geography is limited to the northeast. 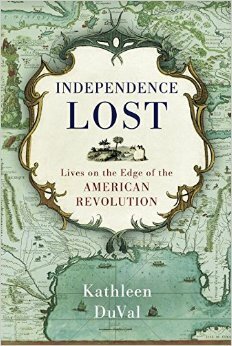 In fact, there were another 13 or so British colonies in North America that did not partake in the revolution. Some of the most successful were along the Gulf Coast, and their history is as rich and fascinating as that of New England’s. DuVal, an historian at the University of North Carolina, has revived their stories in this wonderful history of America’s “other” colonies. DuVal emphasizes narrative over trivia. Rather than a static recitation of dates and names, she tells the stories of nine citizens representative of the time, from Indian tribal leaders and English businessmen to soldiers and women trying to survive in the harsh environment. In this respect, I found its structure similar to that of Dan Baum’s brilliant Nine Lives, which revisited Hurricane Katrina through the eyes of nine locals who experienced it. The drawback to DuVal’s narrative is that, unlike Baum, she doesn’t have direct access (obviously) to the characters, and in the case of the women, it was particularly difficult to find source material. What DuVal does with the little she has is marvelous. Through the crisscrossing lives of her characters, we encounter a vibrant South, very different from the one that emerges in the post-Revolutionary era. It is also distinct from the northeast. Rather than the us-against-them narrative of New England versus the British empire, the settlements along the Gulf Coast scrape together a tenuous coexistence with native tribes, the French, the Spanish and are more concerned with survival than revolution. This is a fascinating look at American history forgotten, cobbled together from the disparate lives of the people surviving in the territories of East Florida and West Florida (which extended all the way to New Orleans). You think you know your American history? Consider it incomplete if you’re just now learning about the importance of Pensacola. And fill in the gaps with Independence Lost.